Children’s Scholarship Fund Philadelphia (CSFP) has just awarded 2,000 brand new scholarships for the 2012-13 school year! Take a moment to watch this story from WPVI-ABC6 in Philadelphia and listen to what some of the newest scholarship recipients have to say about the program. CSFP has awarded private school scholarships to more than 8,500 children over the past twelve years. Today, CSF’s President Darla Romfo appears in an exclusive interview on Newsmax speaking about the work and mission of the Children’s Scholarship Fund. Since CSF’s inception in 1998, almost 123,000 low-income children have been given a chance to transform their lives with scholarships to attend private schools, a true testament to CSF’s co-founders, Ted Forstmann and John Walton. “I think their legacy lives on in every single child and every single parent who is empowered to make that choice for their children,” Darla said. And while public debate continues on how to reform education so that all children can have access to a quality education no matter where they live, CSF knows that empowering parents with the responsibility of choosing their child’s school is a fundamental first step. “In order for any kind of educational reforms and improvement in education to be sustainable, you have to start with the parents. Parents are the only ones who can hold their kids accountable and can hold the schools accountable,” Darla told Newsmax. 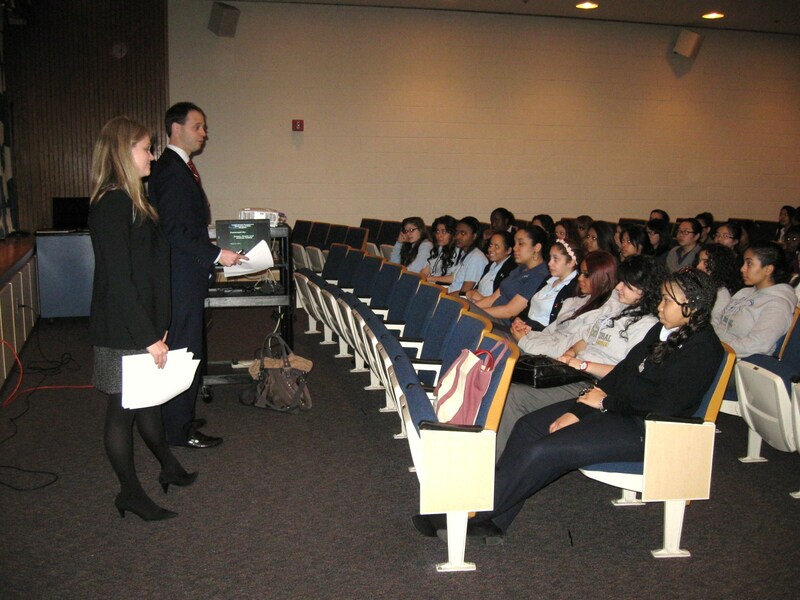 Bankruptcy lawyers Andrea Gildea and James Moore deliver their presentation to Cathedral High School students. This afternoon, the lucky young ladies who are CSF Alumni at Cathedral High School in Manhattan learned about how credit cards work and how making wise financial decisions early on can really pay off. Today’s presenters, bankruptcy lawyers Andrea Gildea and James Moore, are volunteers for an organization called CARE (Credit Abuse Resistance Education). Their presentation covered how to read a credit card statement, the difference between credit and debit cards, and the consequences of spending more than you can afford. Everyone learned something new, even Cathedral Principal Maria Spagnuolo! Our attentive CSF Scholars were full of questions about everything from how to establish good credit (library fines count!) to the intricacies of repossession and bankruptcy (and how to avoid them). After the presentation, a handful of the Cathedral students said they were interested in becoming lawyers, and junior Talisha L. told us she wants to be a judge. Thank you very much to Principal Spagnuolo for hosting and to Andrea Gildea and James Moore for their enjoyable and educational presentation. And to the 86 CSF Scholars now attending Cathedral High School, may you enjoy a lifetime of financial stability and high credit scores! For the 86 CSF alumni now attending Cathedral High School, today's presentation on credit sparked lots of questions.